An Abkhazian dish from the Batumi area, on the Black Sea Coast. Grind together the pork, beef, onion, and garlic. Work the spices in well with your hands and not with a spoon. Soak the caul fat in warm water with a little vinegar until it becomes pliable, then cut it into 4-inch squares. 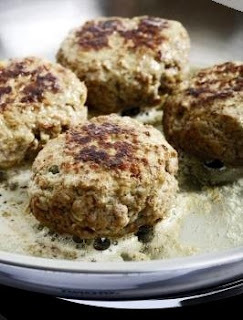 Place a mound of ground met mixture on each square and enclose in the fat to make a plump meatball. Fry the meatballs over low heat until cooked through nicely browned. Serve with tkemali sauce. If caul is not available then form the meatballs like you normally do.